The DCASE2018 Workshop will take place at the WWF Living Planet Centre in Woking, Surrey, UK. The town of Woking (/ˈwoʊkɪŋ/) is 37 km (23 miles) southwest of central London in the county of Surrey. Its population is 99,198 according to the 2011 Census. The venue will be the WWF Living Planet Centre, the head quarters of WWF-UK and one of the most sustainable buildings in the UK. Note: More information will be added as the workshop dates approach. Please check occasionally. 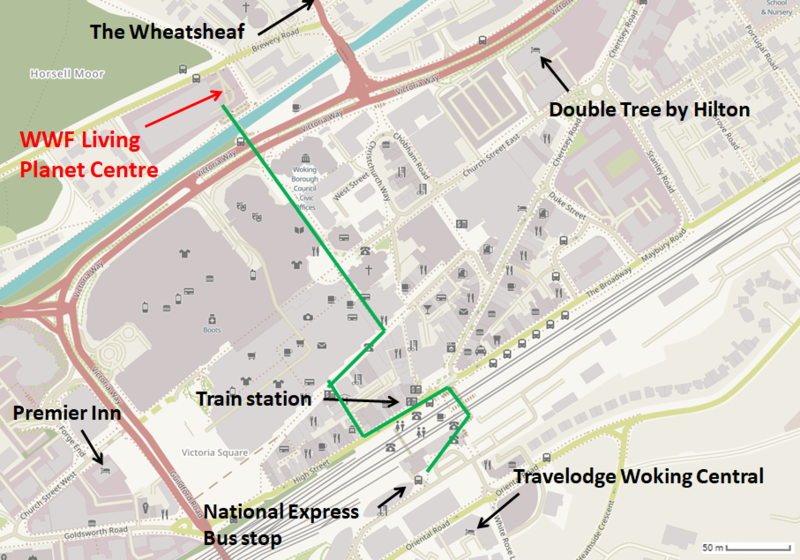 There is a National Express Bus leaving from the Central Bus Station at Terminal 2/3 going directly and without other stops to Woking. Take a train to Guildford and change there to a train bound for Woking (towards London). Trains leave frequently from Waterloo Station. See directions on the Living Planet Centre website. Please note that accomodation is not available at the Living Planet Centre and is not included in the workshop fees. Small budget hotel, situated next to local pub outside the town centre. Large 4-star hotel, slightly more expensive, but cheaper offers might be available because of the time of the year. Located in the town centre, rather affordable. Budget hotel with very good room rates, located at the station. You can find additional hotels, both close by and farther away, using the usual travel service websites or Google Map's Nearby function.